Locals and visitors love the cheerful atmosphere of Georgioupolis. A place where there is always something happening, day and night. The main quaint square is lined with cafes, local tavernas and souvenir shops. Arrive here early enough to savour a delightful cup of coffee under the shade of eucalyptus trees while you soak in the beauty of the local morning routine, just as the village wakes up and prepares for the day. One of the most important wetlands of western Crete, Georgioupolis is famous for its natural water lake, Kournas which is home to many unique and endangered species of birds and aquatic plants. Georgioupolis offers a warm and relaxing holiday experience for all ages, where guests can enjoy authentic Cretan hospitality in a laid back and inviting environment. Read our guide to everything you need to know about Georgioupolis to help you plan your perfect Cretan holiday. Georgioupolis lies on the border between east of Rethymnon (24 km) and west of Chania (38 km). 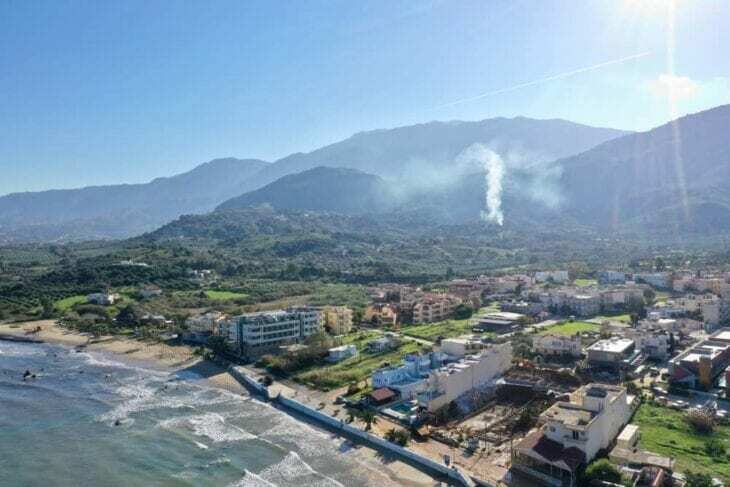 Part of the Apokoronas municipality in Chania, characterised by a wide, verdant plane with rolling hills which graciously extend from the foothills of the White Mountains (Lefka Ori) towards the Sea of Crete. Access to Georgioupolis is fairly easy. It is approximately a 20 minute drive from Rethymnon following the National Road. From there take the Episkopi exit which leads to Georgioupolis. Chania International Airport is 50 kilometres away from Georgioupolis therefor either a rental car or a taxi is advisable. Taxi will cost somewhere around €60 one way. Buses from the centre of Chania and Rethymnon run on a frequent basis, all year round. For those of you who wish to explore the island further, renting a car is the easiest and most affordable solution. You can pick up you car from our offices at the Chania International Airport or use our free pickup/drop off service from any hotel in Georgioupolis. 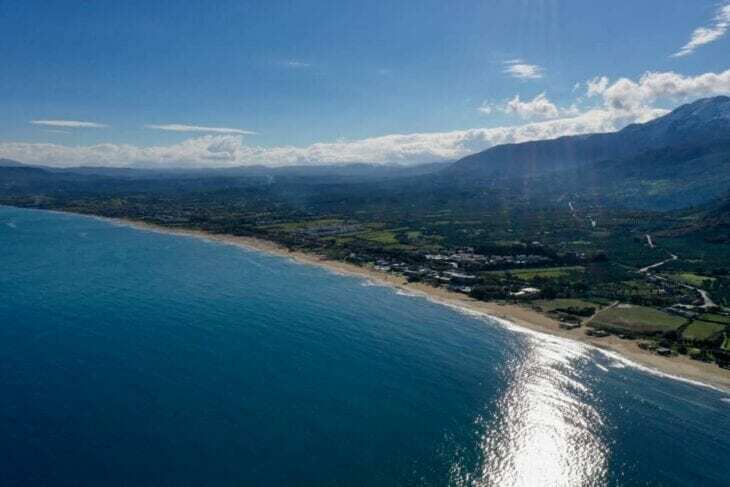 Georgioupolis once a 19th century landscape dominated by an abandoned marsh and malaria prohibited systematic habitation, was as a result transformed into an area of exceptional natural beauty and a flourishing tourism destination. The marsh was drained and eucalyptus trees were planted to control the moisture and the mosquitoes that had extensively occupied the space. The history of Georgioupolis is directly linked to River Almyros which lies at the mouth of the village’s harbor. Founded in 1893 it was named Almyroupoli, translating as the Town of Almiros. In 1899 it was officially named Georgioupolis in honour of Prince George of Greece and Denmark, who played a crucial role during the Ottoman occupation. This small, seaside town offers an idyllic setting lined with abundant eucalyptus trees that greet visitors with their dominating presence. In fact, they are strongly rooted in the villages history. Small in size but blessed with natural wonders, Georgioupolis is home to many birds and animals. Here is everything that you can do in this charming part of the island. Take a leisure walk along the harbor and sit down for a delicious meal in one of the traditional tavernas and restaurants, which offer scenic harbor views. Time moves slowly here, enjoy the slow pace of this delightful village as you sip raki and snack on meze. From here watch the fishermen go out to sea and return with a boat full of seafood treasures. They surely have many tales to share. One can’t help but take deep breaths of its refreshing scent, imagine feeling its powerful properties by walking under the eucalyptus trees. You will find many of them right at the entrance of Georgioupolis. The liveliest part of Georgioupolis is its main square, in fact it is considered to be one of the pretties village squares of Crete. Perfect for people watching, it is one of the top things to do in Georgioupolis for those seeking an ultimate local experience. 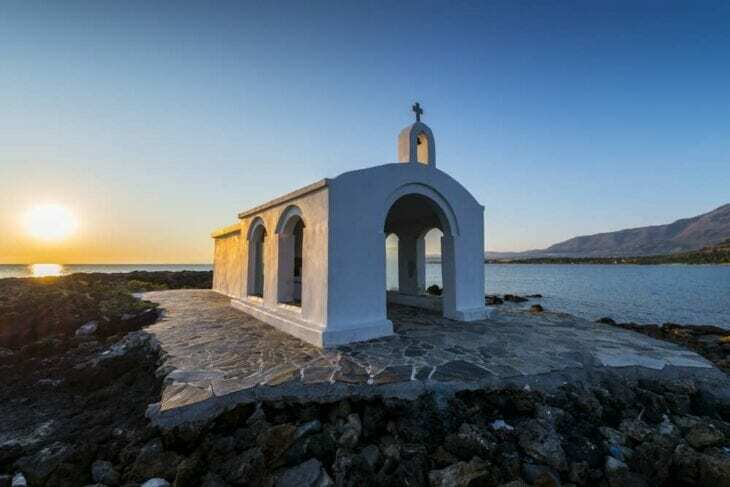 The Church of Agios Nicholas, dedicated to the patron saint of sailors is one of the most popular sights located in the harbor. The picturesque white chapel sits gently on a manmade rock jetty with mesmerising sea views as a backdrop. During rougher weather conditions, the breaking waves add to the magnificence of this gorgeous landscape. This is definitely one of the most photographed attractions in Georgioupolis, and a popular wedding photography spot. The only fresh water lake in Crete is a fantastic site to visit. A gorgeous lake with its mesmerising waters and impressive mountain peaks, offers visitors a spectacular display of eye-catching contrasts. For an active day in the sun, you can rent some paddle boats to explore the lake at your leisure. Or simply relax on the beach while the sun’s rays are kissing your body. There are umbrellas and sunbeds available for rent. Aside from swimming you might also enjoy a leisurely hike around the lake. The terrain is easy and great for all levels. There are also several tavernas and cafes located right by the lake, where you can enjoy a delicious meal while admiring the scenery. The sunset hour is definitely a highlight. Lake Kournas is also one of the top sites for bird watching in Crete. Both sides of the harbor are lined with a stretch of coastline. Kalivaki beach, situated to the west of the harbor has shallow waters and spectacular dunes. It is here that the River Almyros flows directly into the sea. Here, you will also come across sea turtles basking in the sun and occasionally geese pay a visit to this part of the village. The beach is protected from the winds making it the ideal choice for families with children. There are organised facilities on the beach as well as a few tavernas serving snacks and seafood dishes. 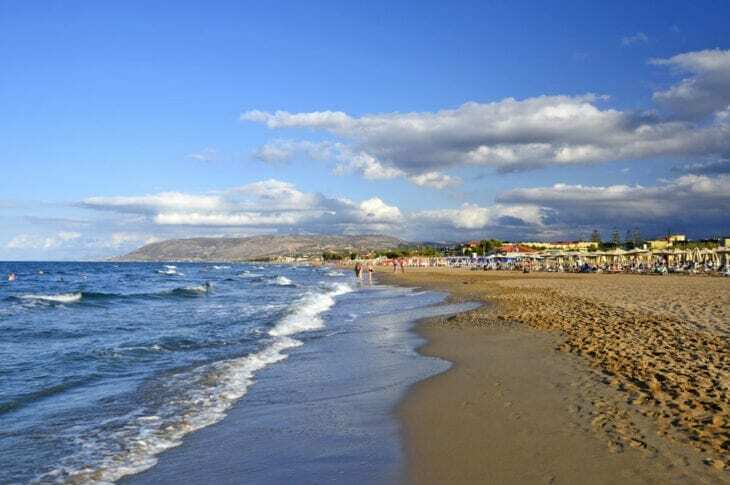 Georgioupolis Beach is a 10 kilometer stretch of beach, awarded with a Blue Flag certification. An organized beach where you will find an array of water sports facilities including scuba diving. There are also several tavernas and cafes serving fresh, local cuisine. One of the most charming coastal villages, Georgioupolis is a must visit for those who find themselves in this part of the island. 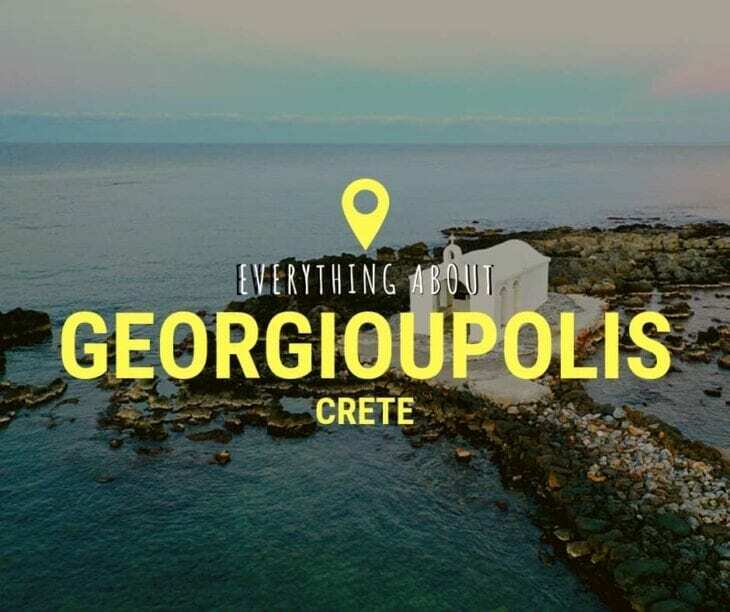 Enjoy reading our guide to everything you need to know about Georgioupolis, and we look forward to welcoming you to Crete.